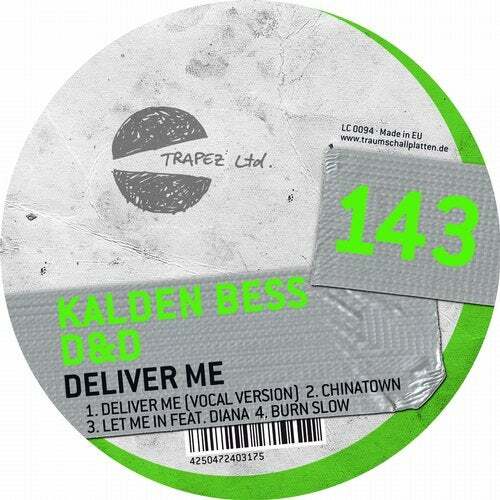 Kalden Bess kicked off his career in 2008 when he was living in Montreal.Since then he has continuously released quality music which enabled him to work together and be remixed by artists such as Pig&Dan, Jerome Sydenham, Secret Cinema, Gary Beck, Sasha Carassi, Markantonio, Rino Cerrone, Audio Injection, Drumcell, Pfirter and many others.His first EP with Trapez ltd contains 4 brand new tracks.Kalden wrote "Deliver Me" together with his Canadian fellow musicians D&D. The track has the funk of heavy Chicago house and the sensuous singing of Shantelle Rowe that gives it a hedonistic tweak... involving a bit of a vintage backlash here. It is what you miss with a lot of music that emotions can really be grasped. "Chinatown" also produced together with D&D convinces with a symphonic impact towards the second half of the track and by doing so adding some glamour to the world of techno it deserves. "Let Me In feat. Diana" has vocalist Diana sing angel like into this dark and moody track. The feeling is quite noir at times almost apocalyptic and will do great in dark clubs. "Burn Slow" is a hard breathing, hard rocking beat track where everything flows together as if it was go liquid matter. The track connects nicely to also older pieces of techno so it will find its fans in many corners of the world.